Sparsha was directed by Sunil Kumar Desai and co-starred Rekha, Sudha Rani and Naveen Mayur. It was a debut for Sudeep in lead role and established him Kannada Industry strongly. Film tells the story of young film maker falling in love with a girl, but accidentally he knocks down a girl in railway station and becomes reason for she losing legs. He believes in a principle that one who does the mistake must correct it and because of that he offers to marry the girl who lost her legs. But still he doesn’t reveal his true identity and the girl still searches for the one who broke her legs. Huchcha was directed by Om Prakash Rao and co-starred Rekha Vedavyas. It is the first blockbuster hit of Sudeep career, film was a remake of Tamil super hit Sethu starring Vikram. Film tells the story of young carefree man losing his memory in a fight for his love. Swathi Muthu was directed by D. Rajendra Babu and co-starred Meena and Kishan Shrikanth. It was a remake of Telugu blockbuster Swati Mutyam starring Kamal Haasan and Raadhika. Film tells the story of young village man who is ready to do anything to make others happy. Due his low intellectual caliber he was given low profile jobs in the society. He marries a widow to help her and rest of story is how he takes care of her after the marriage. My Autograph was directed by Sudeep and co-starred Meena, Sridevika and Deepu. Film is a remake of Tamil blockbuster hit Autograph starring Cheran and Sneha. My Autograph was Sudeep’s directorial debut and celebrated 175 days run at box office. Film tells the story of young man in flash back. Hero goes on a journey to distribute his wedding invitations and he remembers the childhood days memories with them. Film ends with his wedding attended by his ex-girl friends. No 73, Shanthi Nivasa was directed by Sudeep and co-starred Anu Prabhakar, Deepa, Master Hirannayya and Komal Kumar. Film tells the story of young cook who is helps the people wherever he goes. He is believed in a principle that you should do someone’s work to experience the joy of life. When he visits “No 73, Shanthi Nivasa” house he wins the heart of everyone immediately and rest is how he makes them to reconcile together. Maathaad Maathaadu Mallige was directed by Nagathihalli Chandrashekhar and co-starred Dr.Vishnuvardhan, Suhasini, Rangayana Raghu and Tara. Film tells the story of village head fighting for justice. He is a happily settled flower seller in the village. When business men come to know about the mine deposits in the village they bribe the government officials and politicians to get land notification in their name. Village head having lost his followers resorts to hunger strike and wins the battle. Mussanjemaatu was directed by Mahesh and co-starred Ramya, Anu Prabhakar, Sumithra and Ramesh Bhat. Film tells the story of Radio Jockey who runs a radio programme “Mussange Maathu” for depressed people. Heroine calls him one day and was impressed by his suggestion. Subsequently they meet accidentally and become good friends. He was in love with her even before meeting her officially, rest of story is whether he expresses his love to her or not. Phoonk was directed by Ram Gopal Varma and co-starred Amruta Khanvilkar and Ahsaas Channa. Film was made with budget of INR3 crore and earned INR33 crore at box office. Film tells the story of Civil engineer and atheist being involved in black magic. When he goes to Mumbai to live with his wife and children his family is haunted by black magic. Rest of story is how he overcomes the problems. Veera Madakari was directed by Sudeep and co-starred Ragini Dwivedi, Tennis Krishna, Devaraj and Doddanna. Movie was a blockbuster hit and celebrated 100 days run in Karnataka. It is a remake of Telugu hit Vikramarkudu. Film tells the story of fraudster who falls in love with a girl. He replaces look alike sincere police officer in order to bring down the villains. Veera Parampare was directed by S. Narayan and co-starred Ambarish, Aindrita Ray, Shobaraj and Sharan. Film was made with budget of INR5 crore and earned INR10 crore at box office. Kempe Gowda was directed by Sudeep and co-starred Ragini Dwivedi, P. Ravi Shankar, Girish Karnad and Ashok. It is a remake of Tamil blockbuster hit Singam starring Surya. Kannada version was also a huge hit at box office. Film tells the story of young firebrand police inspector who goes against the local goon. Enraged by this local goon gets him transferred to a place where he is very strong, rest of the story is hero preparing himself for a bigger fight. Vishnuvardhana was directed by P. Kumar and co-starred Bhavana Menon, Priyamani, Sonu Sood and Dwarakish. Film is considered as a tribute to Dr. Vishnuvardhan. Due to its title it was released amidst controversy and at last it was renamed as Only Vishnuvardhana. Film was a blockbuster hit and earned INR160 million at box office. 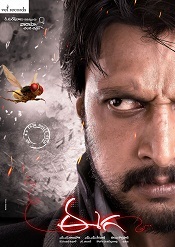 Eega was directed by S. S. Rajamouli and co-starred Samantha and Nani. Film was made with budget of INR260 million and earned INR1.25 billion at box office. Film is considered as biggest hit of Sudeep career and turning point of his South Indian Film career. Film tells the story of young man taking birth as a fly to take revenge against antagonist. His lover micro artist is unaware of death of his boy friend. Fly reaches her and tells him the story behind his murder. Both join hands to take revenge. Varadhanayaka was directed by Ayyappa P. Sharma and co-starred Chiranjeevi Sarja, Sameera Reddy, Nikeesha Patel and P. Ravi Shankar. Film was made with budget of INR90 million and earned INR142 million at box office. Bachchan was directed by Shashank and co-starred Jagapati Babu, Bhavana, Parul Yadav and Tulip Joshi. Film was a huge commercial success and later dubbed into Hindi and Telugu. Maanikya was directed by Sudeep and co-starred V. Ravichandran, Varalaxmi Sharathkumar and Ramya Krishna. Film was made with budget of INR18 crore and earned INR43.5 crore at box office. Film was a huge blockbuster hit and became the Highest Grossing Kannada movie of all time. Film tells the story of young college guy who comes to India to bring to rival families together. The rivalry is going on for 27 years and now hero comes to India to end the animosity and unite his parents.